The lush green rainforest clad mountain backdrop to Tropical North Queensland hides many treasures. One of them is the Atherton Tablelands, the ‘food bowl’ of the north. To guarantee a regular water supply to this important agricultural region, Lake Tinaroo was born by the damming of the Barron River. This huge lake, which has many easy access points, offers many recreational and sporting activities from sailing, speed boating, water skiing, sail board riding, house boating and of course FISHING. 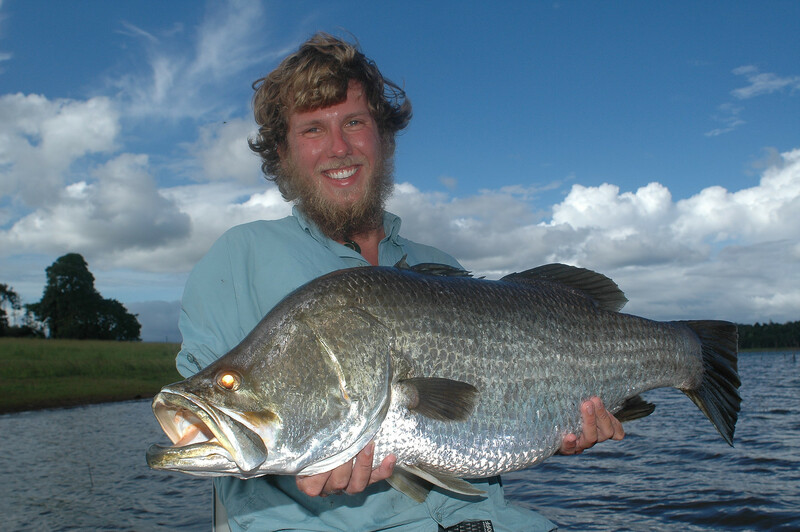 Several years ago the Queensland Department of Primary Industry wisely decided to stock the lake with both Barramundi and Sooty Grunter as part of its Recreational Freshwater Fishing Enhancement Program. The Tableland Fish Stocking Society was born and after much lobbying, fund raising and a hell of a lot of hard volunteer work, thousands of fingerlings were released some years ago. Both species thrived in the food rich waters and grew fat, but not lazy. Phenomenal growth rates from these fish have been observed. Barra to over 50lbs are a regular capture now, Sooty’s are monsters here as well, with the world record fish of over 12lbs having been caught here from the tops of drowned timber. 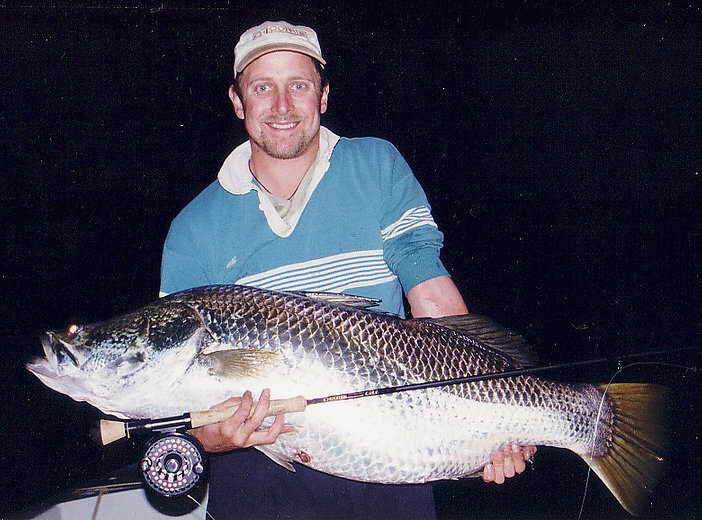 Don’t let anyone tell you that impoundment fish don’t fight! There are many lightening strikes and strong prolonged runs from these fish, and light tackle is not the go here. Strong, medium length baitcasting or spinning gear, loaded with at least 10kg line is required as is hardy lures with beefed up hooks and rings. With all these positives there must be a down side. 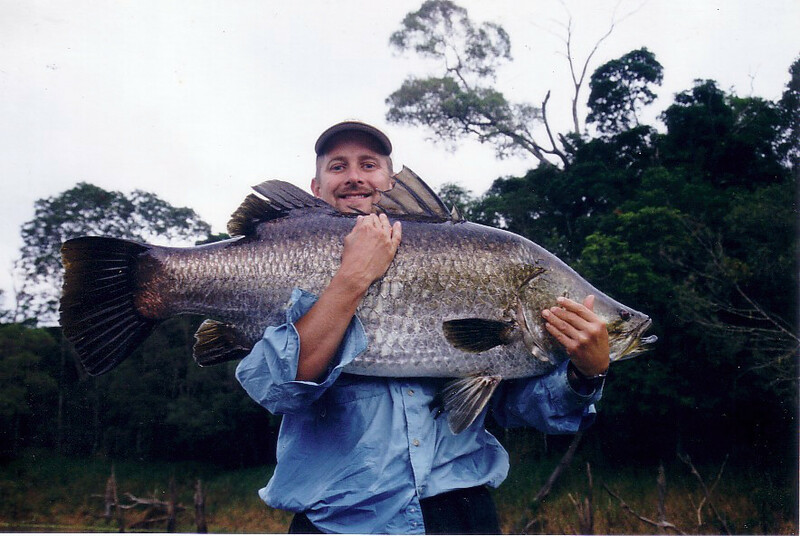 Barramundi are fairly inactive in cold water and Lake Tinaroo is in the mountains and subject to a much greater temperature variation that coastal waters. During the cooler months they are almost impossible to catch, while during the summer the conditions must be almost perfect to be able to target these fish with any confidence. Persistence is the key. On warm, balmy, humid days, sunrise and sunset is prime barra time up here. You must be on the water early or late to consistently catch these monsters. As the first, and last, of the suns rays hit the mirror surface waters of the lake, the bait fish go crazy, and so do the Barra. Feeding Barra will turn on and off just as quickly, having gorged themselves on the ample supply of food. This window of opportunity is very short, sometimes lasting only 30-45 minutes at best. Look for any holding structure in the lake, shallow weed covered water, or small running creeks where the barra will ambush their prey. Sooty’s are not so structured in their feeding habits and can be caught on lures throughout the day but here too, morning and late afternoons are still the best. Smaller lures should be used here, casting around the “carrot topped” drown trees. These fat fish strike quickly and can hang you up in an instant.